From the beginning when I opened Punky’s Pizza & Pasta in the Bridgeport neighborhood in 2002, I wanted a restaurant with a menu strong in tradition & old world hospitality. Both my wife & I were born, worked & raised in a family of four children in Bridgeport, giving my family a long rich history in the neighborhood. 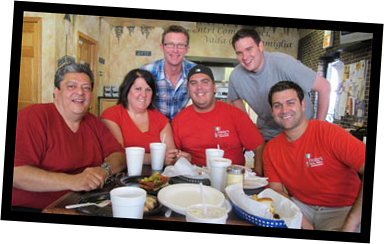 As our customers, you will find all of the wonderful traditions of the old neighborhood when you come to dine at Punky’s Pizza & Pasta. Artisan created meats, cheeses, breads & the freshest vegetables round out the medley of quality ingredients that we use to bring you our family’s signature dishes. My family & I would like to thank all of you for your support & loyalty to our restaurant. Without you, Punky’s Pizza & Pasta would never have been as successful as it is today. Please know that when you dine at Punky’s Pizza & Pasta, this makes you part of my family.